What Year Was Your Best New Year's Eve? How better to contrast "Titanic" than with the Lewinsky thing? It would never have occurred to me to nominate "Titanic" for Best Picture; I say that "In & Out" was the best movie of 1997 (it certainly made Kevin Kline my favorite actor). Even ignoring that, "LA Confidential" and "Good Will Hunting" were better than "Titanic" (and they completely snubbed "Amistad"). 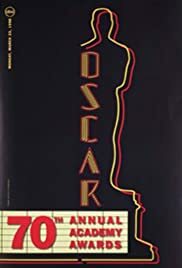 What I really liked about "The 70th Annual Academy Awards" was how Billy Crystal related everything to the Monica Lewinsky scandal (although there was no reason for him to rag on "Mars Attacks!"). But probably the best single line was Robin Williams's acceptance speech: "Thank you Ben and Matt. I still wanna see some ID. "; only Robin Williams could think of that! The low point was James Cameron's overblown "I'm the king of the world" comment. But either way, it's just neat seeing Jack Nicholson's various faces when he attends. And I noticed that each of the Best Picture nominees - including "The Full Monty" - took home at least one Oscar. As for the collection of surviving winners, it affirmed that Faye Dunaway is still really hot! All in all, a pretty good night.